Condition is New. Plain Paper Fax/Phone/Copier. Cheapest Price on eBay! Free Fast Shipping!! Panasonic KX-FPG175 2.4 GHz Digital Cordless Answering Messaging System Thermal. Condition is Used. The handset needs new batteries and the Pinter likely needs new thermal film. See photos for condition details. Feel free to ask questions! All sales are final due to cost of return processing. Cordless phone set. Extra thermal paper roll. Fax machine. Hand copy capability. The scanner can be taken out and scan on a surface. Retired from my own use. I am the original owner. User manual in Japanese. For EXAMPLE WILL GO WITH KX- FMC 230 FAX/ COPIER, ETC. AND MANY OTHERS AS WELL. Hp 1250 Fax Machine . Condition is Used. Everything works properly, no issues. Great fax machine. Comes with the power cord and phone cable, as shown on the picture. I personally used it no more than 10 times. It's just been sitting in my storage. USB port enables laser printing from a computer. Maximum monthly duty cycle of up to 10,000 printed pages. USB interface for future laser printing, up to 21ppm. Fax Machine Type Laser. Built-in Interfaces Enable Laser Printing. HP 2140 Fax/Copy Machine with Handset, works good, been tested. Brother FAX-560 Personal FAX Machine Phone Fax Plain Paper Caller ID Copy. FAX MACHINE IS NEW IN BOX...BOX DOES HAVE DAMAGE DUE TO ITS AFE Shipped with USPS Priority Mail. HP 1040 Inkjet Fax Machine W/built-In Telephone Handset Printer Scanner. Shipped with USPS Priority Mail. This is a new-in-box fax machine being soldas is. We do not take debit or credit. I have three rolls for the Panasonic fax units in two boxes. Sharp Fax Machine Imaging Film UX-3CR. There is only 1 roll. Condition is New. Shipped with USPS Retail Ground. Any questions, please ask. Buy with confidence! You Support A Dream. and may have small flaws or minor wear. HAS 1/2 ROLL FILM INSIDE AND A SEALED ROLL OF PAPER BOX NEVER OPENED. Muratec Imagemate Donor Film Roll For CX or MX Plain Paper Fax Machine New. Condition is New. Shipped with USPS Retail Ground. Fax Refill Rolls (2). f or Sharp UX-300 UX-305 UX-460. 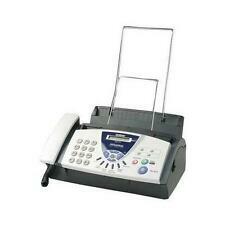 (1) Panasonic KX-FPG376 Fax Machine. Item is in good condition witg minor signs of use as shown. Item is tested and works well. Ink not included. (1) Cordless Phone Battery. HP 2140 Fax Copy Machine Professional. Condition is Used. Shipped with USPS Mail. Enhanced copier that enlarges, reduces and collates copies. Plain Paper Fax/Copier. Out of paper reception (up to 24 pages – 300KB). Trending at $78.65eBay determines this price through a machine learned model of the product's sale prices within the last 90 days. Up for sale is an AT&T model 7860 DIGITAL MESSAGING CENTER. This is a FAX, COPIER, DIGITAL ANSWER MACHINE and is New Old Stock. It uses 'THERMAL PAPER'�� This was declared excess from a local university. It is in the original box..
Two rolls in a box, never open, and one roll in another box. total of 3 rolls. Fax copier & digital answering machine. Tested Brother IntelliFAX 1860C SuperG3 33.6kbps Color Fax Copy Machine Plugs in and powers on fine Check out the pictures for best description and as always, feel free to message any questions Thanks for looking! Fargo 45000 YMCKO ribbons consist of yellow (Y), magenta (M) and cyan (C) panels for printing a full spectrum of colors by combining the colors using varying degrees of heat. Fargo 45000 ribbons are specially back-coated to extend printhead life. New never removed from factory sealed box. New in open box! Looks to me like everything is in the box, including the instruction manual. See photos for more details. Please ask any questions before purchasing. Thanks for looking and have a nice day! PANASONIC KX-FP205 compact plain paper Fax and Copier MACHINE. Shipped with USPS Priority Mail. Number of Tiers: 3 Pcs. And with the portable design, it is easy to use when you want to use it. It is delicate design with beautiful appearance, and gives color to your life. What is more, it is easy to install by yourself without spare tools. Compatible with the following SHARP manufacturer and model #'s Page Yield 500. Product images are for fit/compatibility reference only. Condition OEM EQUIVALENT. PRODUCT SPECIFICATION. Panasonic KX-FA91 Toner for KX-FG2451, FP205 and FP215. Manufacturer: Panasonic. Panasonic KX-FG2451. Panasonic KX-FP205. Recycled Content: 0%. Recycled: No. Country of Origin: Malaysia. Green Compliance Certificate/Authority: ENERGY STAR. Green Compliant: Yes. Genuine Panasonic KX-FA55 Fax Film KXFA55 2-Roll for, Sealed OEM packaging.